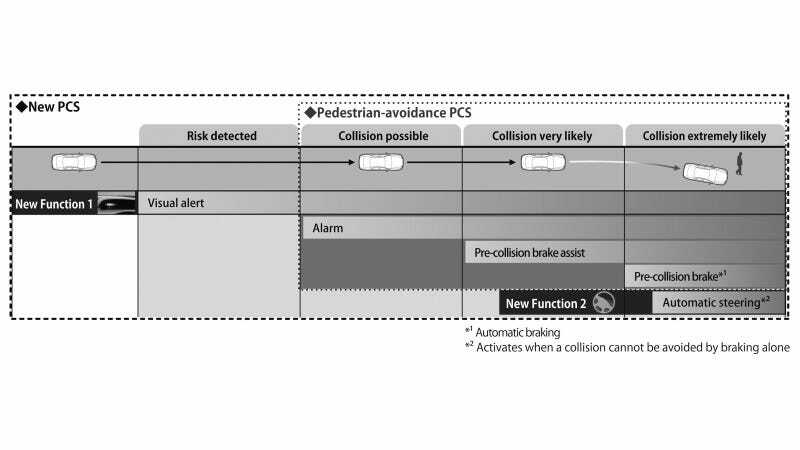 Toyota City, Japan, Oct. 11, 2013 — Toyota Motor Corporation announces that it has developed a Pre-collision System (PCS) that uses automatic steering in addition to increased pre-collision braking force and automatic braking to help prevent collisions with pedestrians. Toyota is committed to developing safety technologies that help eliminate traffic fatalities and injuries involving pedestrians and other vulnerable road users. The new PCS with Pedestrian-avoidance Steer Assist can help prevent collisions in cases where automatic braking alone is not sufficient, such as when the vehicle is travelling too fast or a pedestrian suddenly steps into the vehicle’s path. An on-board sensor detects pedestrians and issues a visual alert on the dashboard immediately in front of the driver if the system determines that there is a risk of collision. If the likelihood of a collision increases, the system issues an audio and visual alarm to encourage the driver to take evasive action, and the increased pre-collision braking force and automatic braking functions are activated. If the system determines that a collision cannot be avoided by braking alone and there is sufficient room for avoidance, steer assist is activated to steer the vehicle away from the pedestrian. The number of traffic fatalities in Japan has declined for 12 consecutive years, reaching 4,411 in 2012. However, of that total, pedestrian fatalities are the most common, accounting for 37.0 percent*. Last year, Toyota developed a system that uses increased pre-collision braking force and automatic braking to help prevent collisions with pedestrians. The system, which was adopted on the Lexus “LS”, warns the driver when it detects a potential collision with a pedestrian or obstacle. If the driver does not take action to avoid the collision, the system activates. TMC aims to make PCS (Pedestrian-avoidance with no steer assist) more affordable and roll it out by 2015 on a wider range of vehicles, before introducing PCS with Pedestrian-avoidance Steer Assist.